Collingwood Half Marathon Blog and News. 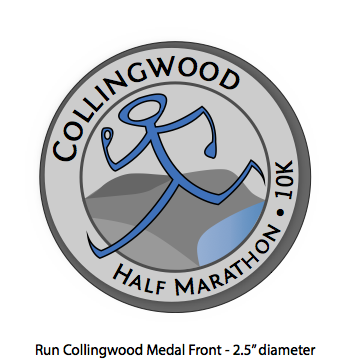 Collingwood Half Marathon Blog and News. Our Collingwood Half Marathon blog page contains all the milestones to keep up with our race preparations. After the race check back for news of results and personal interest stories. 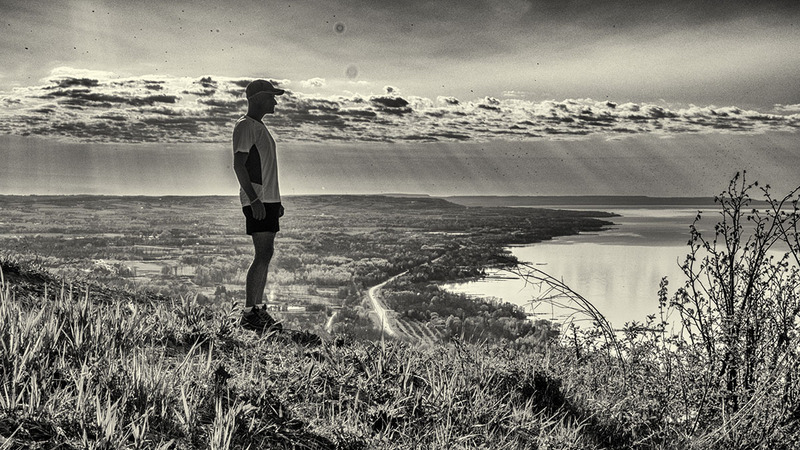 What’s it like running here in beautiful Collingwood and the surrounding countryside? Stay tuned to this page for some anecdotes from our local runners including our own Georgian Triangle Running Club. We really are lucky living here in Collingwood and the Georgian Triangle with it’s combination of rural roads, trails, hills, waterfront runs etc. We all remember a time we discovered running. Perhaps it was something started in school, maybe it's something discovered later in life. It could have been accidental or deliberate or maybe begun as an answer to a dare. Maybe we embraced running because we found that in spite of our preconceived ideas we actually found out that we liked it! There are as many reasons we run as there are people on this planet. It can be for the fitness, camaraderie, meditation, weight loss or maybe connecting to our primal selves. We can escape our stress hectic lives to a place where we only need care about one foot in front of the other and repeat. Unless we are among a very select group of elite athletes we certainly don't do it for the money or the fame. I believe that running is many things. As your race director I believe that it's always best have a very good idea of what motivates runners. I understand that not all runners are the same and the reasons and events leading up to the pursuit of running are different. 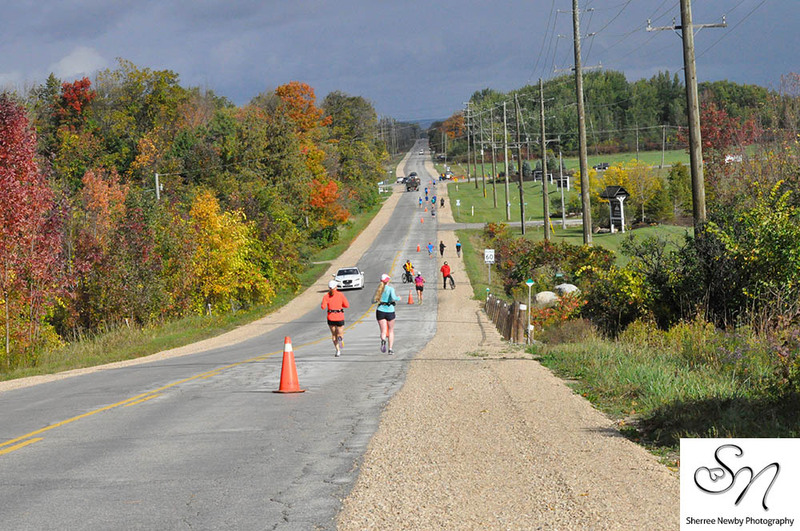 I created the course for the half marathon & 10K here in Collingwood to be fast with minimal hill climbing for those who wish to run a P.R. The current course record for the half marathon is 1:11 and I feel it could be run faster. 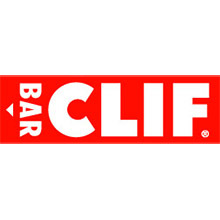 This is the domain of the near elite and elite runners. Their reasons for running are clear, to compete, to excel to prepare for larger venues. There are beautiful views of the town in which I was raised and the surrounding countryside as well to provide a beautiful backdrop for those who run for fun as well! The fall colours at this time of year are so pretty. We applaud all of the recreational runners who come together in the spirit of friendly competition. With running we really only ever compete against ourselves. The ongoing drama of every personal journey in this race and many others fascinate me. I love being the race director who stands at the finish line welcoming everyone and cheering you home. When I see someone come across the line I know that for them this may have been the race of their life. I know that every one of you has risen above the norm and committed to training and racing with us and I feel pride. I've received emails of thanks from runners here at home as well as from other countries who have said how wonderful their experience was. I can say that were it not for the 100+ volunteers, 21 police officers, local businesses and the residents who open their town to us, that this event would be impossible! This is a grassroots community race so welcome to Collingwood! I've mentioned many possible reasons for running. My journey as a runner, like yours is ongoing. I started in middle school, continued running track and cross-country in high school and then continued into adulthood. 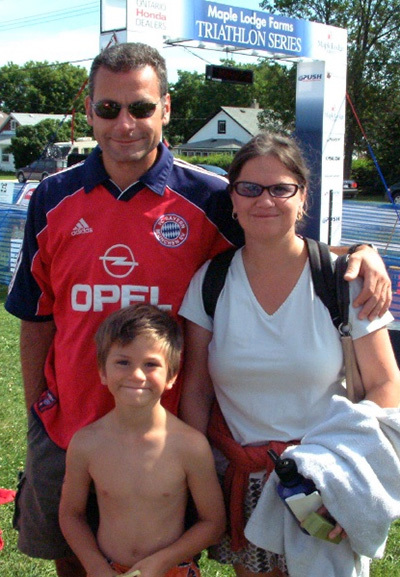 As an adult I ran 5K, 10K, half and full marathons up until 12 years ago when I progressed to trail ultra running. Now at age 55 I'm enjoying the fruits of this lifestyle, having no real medical issues or pain and continuing on with 5oK, 80K and 160K trail races. Of course that's just the physical aspect of running. For me I've found that the biggest benefit of running is the mental & spiritual aspect. It centres me, relieves stress and provides a great perspective on life. I know that I literally found myself running 24 hours in the rocky mountains. I felt completely connected to everything and everyone. It was an epiphany and a life changing realization that all the noisy busy problems we concoct for ourselves are meaningless. The only thing that matters is to be in that moment running. I hope that you may be able to relate to these thoughts, and I wonder what sort of perspectives, realizations, therapies or any other feelings you have gleaned from running. Please do share! email me at: nick@inzaneplanet.com and let me know! I would like to share your stories (only if you want) on this blog and on our social media page. You can start with telling us why you signed up for this race! I'm so looking forward to seeing you here in Collingwood on October 6th, 2018! 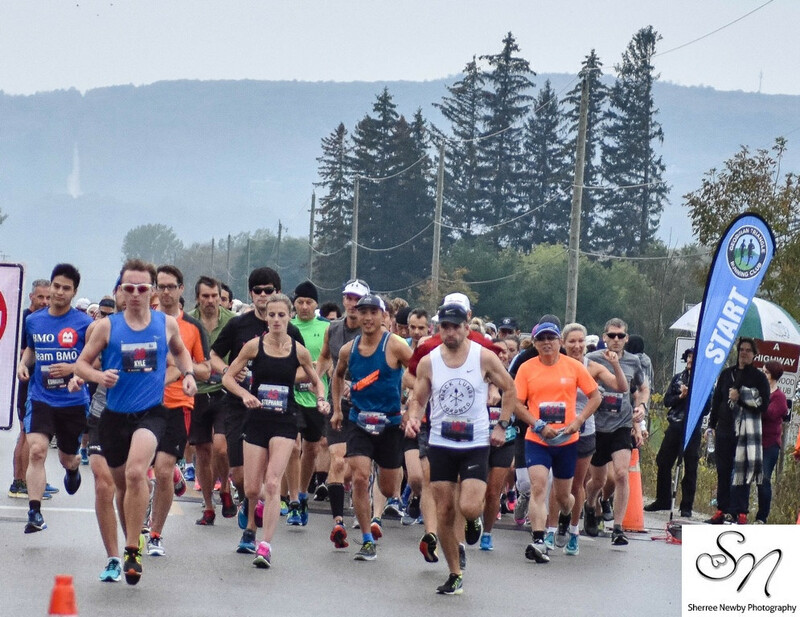 The 5th annual Collingwood Half Marathon & 10K was a tremendous success with nearly 600 runners of all ages participating in the half marathon, 10K and the 2K kids race. The fresh air, brisk weather was typical for October but actually quite conducive to running fast times with the half being won by Ross Bain in 1:18:32 and a 1:32 coming from top female Sarree Sasson. The top 10K runners were Nicolas Peleato with a 36:13 and Katherine Ahokas coming in at 40:26. As well the kids were very fast in the 2K race with winners Cameron Bennet at 8:33 and Piper Mitchell at 9:25! There were so many personal triumphs and celebrations such as the young woman who celebrated her 21st birthday by running 21 km! Our 100+ volunteers were their usual amazing selves providing marshalling, aid station support bike patrol and setup/teardown of the course. As well we would like to thank our strong OPP contingent without whom we couldn’t operate a road race. 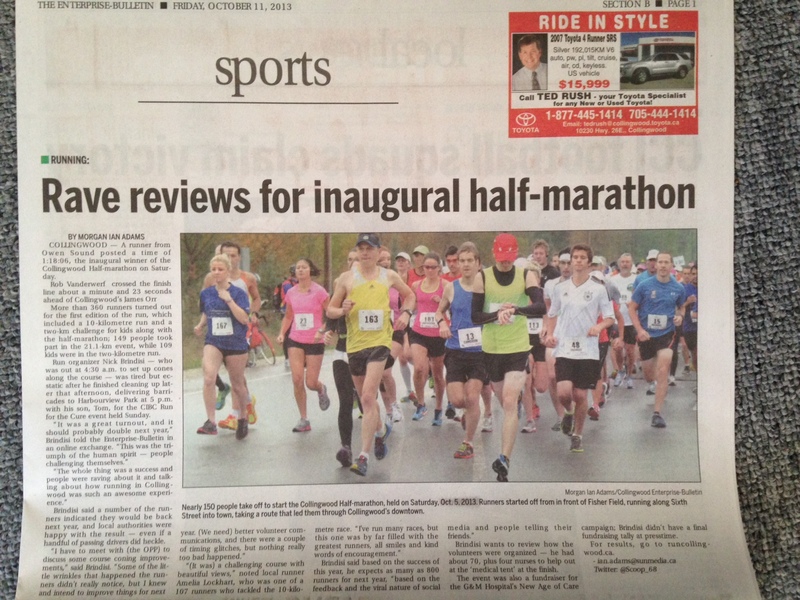 People are loving our small town country race with the big city amenities. As a partner race to the Goodlife Fitness Toronto Marathon we draw on a wealth of experience and resources to make this a great race experience! See you October 6th, 2018! 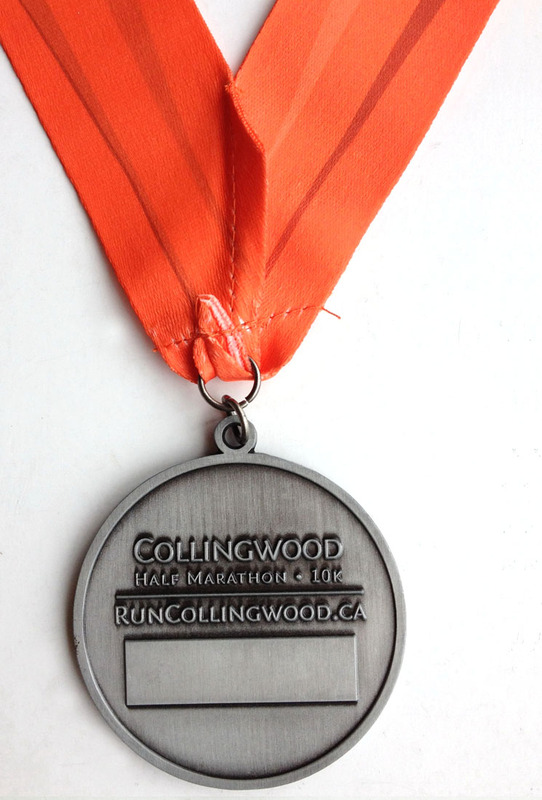 The 4th annual Collingwood Half Marathon & 10K is almost upon us! this year promises to have the best weather so far! I know as race director I’m going out on a limb saying this, but the warm summer and lack of rain seems to be sticking around. We want to make this a success for our main charity the Collingwood G&M Hospital Foundation and have committed a portion of your entry fee to the cause. We are more than happy to accept your pledges as well though! If you would like to get sponsored or make a donation to the hospital please click here>. We really do have the freshest air you can get in a road race and you can’t beat the fall colours! The trees are just starting to show a tiny amount of colour today on September 6th, but by race day October 1st I’m certain that they will be in full living colour! 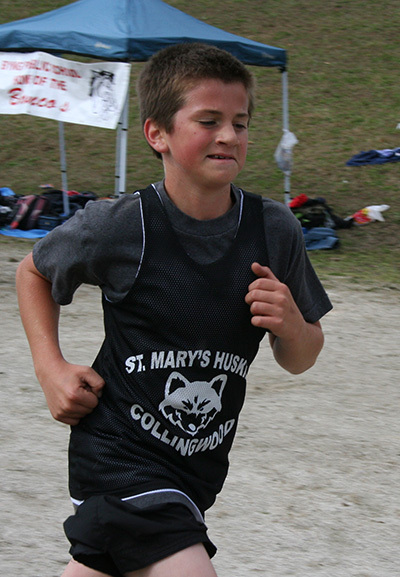 New this year we have added a kids 2K race for school aged kids 4 to 12 years old. It’s a great way to make it a family affair. Bring grandparents or other family or friends along so that you can run the half or 10K while your kids run the 2K and then cheer you on as you finish! They can head over to the Healthy Kids Community Challenge tent and make a cheering sign for mom or dad too! See you October 1st, 2016! So many people to thank for helping us pull off a highly successful event. Thanks to Sgt. Len Devine, Staff Sgt. Phil Browne and Mike King of the OPP for their large highly organized traffic team. Thanks to Chris Stoutenburg of Collingwood Parks and Recreation for working so closely with us to get our permits in place and supply us with some of the equipment and facilities we require. Thanks to Her Worship Mayor Sandra Cooper for coming out to welcome the runners and to blow the horn to start the race. Thanks to Gord and Laurie Sheppard for leading this year’s course setup and teardown team. Thanks to DJ Lenny for the great finish line music! Trucks and trailers for road coning and sign operations graciously supplied by Doug Measures and Tom Hartle. Thanks to Bygone Days Farm for our race venue. Thanks to the running First team and Chiptime results. Thanks Espresso Post and Pretty River Academy for your water station volunteers! Maximum Physiotherapy and Synergy Health and Wellness Centre. Cam Alma and the Skiis & Bikes team. Martynuik Crystle, Laurie Roest, Alison Sheffer, Mike Collins, Mark Bannerman, Sue Friebel, Debbie Twining, Austin Twining, Simon Scholte, John Fox, Gary MacDonald, Jim Theobald, Peter Zober, Chris Keiser, Madeline Fisher, Anne Holden, Craig Holden, Kathy Jeffery, Lindsay Lyall, Lynda Lyall, Dana Calder, Susan McPherson, Forsakes Cathie, Margaret Wilton-Siegel, Doug Wanamaker, Helga Wanamaker, Doug Smith, Nancy Smith, John Brown, Sue Diggins, Albert Gardiner, Paul Henderson, John Bailey, Megan Diggins, Cathy Sears, Elaine Schiller, Terry Sears, Elaine Schiller, Helen Bull, Grace Rutledge, Janet Thompson, Mark Bannerman, DebbieLatimer, Sally Ann Slevin, Mike McCluskey, Sarah May, Pearson Lydia, Maggie Smyth, Erik Moortgat, Nicole Reason, Jim Twining, Cait Foisy, DJ Lenny Sheffield, the Halbertsma family, Doug Measures, Tom Hartle, Austin Twining, Marg Brindisi, Carla Hanisch, Angela McGann, The Wilson family, Francois Fornier and family, Jane Keast, Rob Chambers, Bill Porter, Nicoletta Coldas, Suzanne Halligan, Cathy Korsakas, Rita Runstedler, Jane Schurr, Marlowe Peets, Annie Pilon, Stuart McDonald, Ilian Halbertsma, Eric Robitaille and family, Kelly O’Neil and many more and if I left someone out please forgive me! 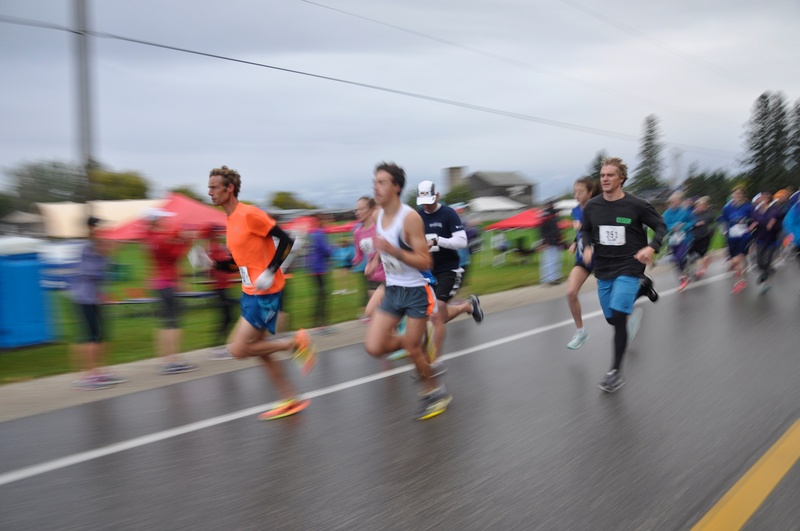 The 2nd annual Run Collingwood Half Marathon & 10K was held on Saturday October 4th, 2014. 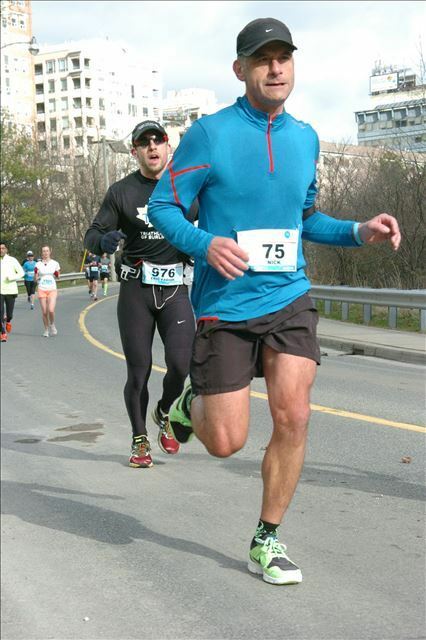 The cool, windy and wet weather gave way to sunshine shortly after the start, making for perfect running conditions. 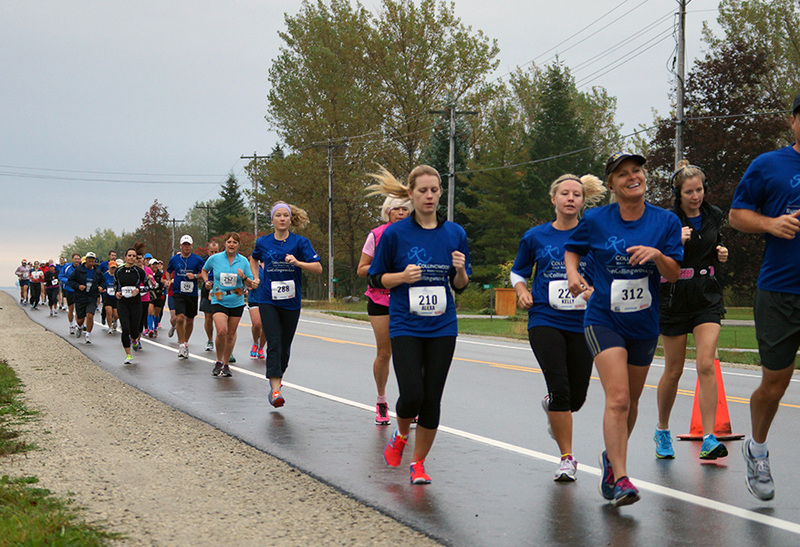 We were happy to host 340 of the 400 registered runners who braved the conditions at the start of the race. 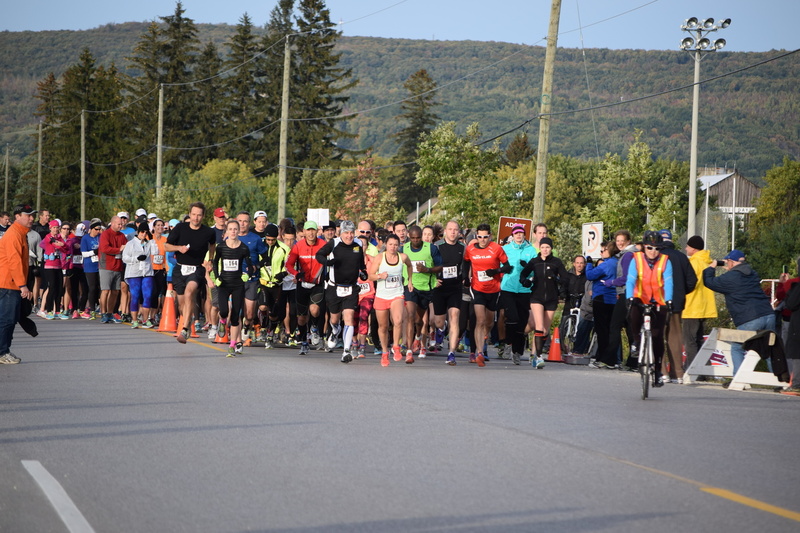 Participants were able to enjoy the scenic course which winds its way through historic, scenic downtown Collingwood before heading out towards the fall colours in full bloom on the escarpment. 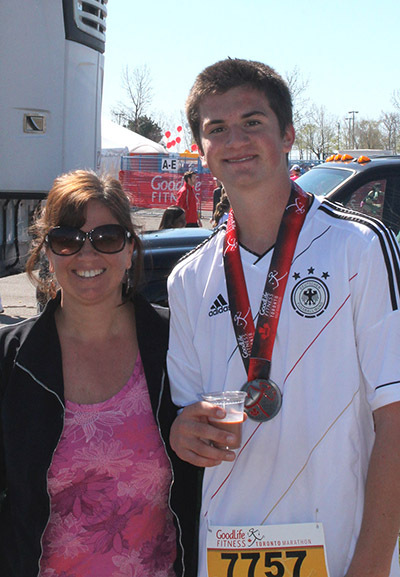 The event featured runners from Canada, the Netherlands, USA, Ireland and Australia. 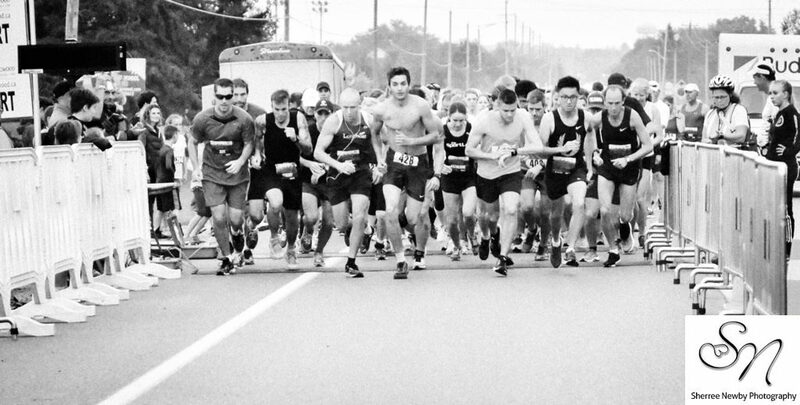 We hope to grow to 800+ runners next year in our 2015 event with the goal of increasing the amount we are able to raise for the G&M Hospital Foundation. We would like to thank the 120 volunteers involved with course marshaling, bike patrolling, course setup/teardown and water station duty. We would also like to thank the town parks & rec. department as well as the 21 OPP officers patrolling the event. It was truly a community supported event that shows what a wonderful community we live in. Hello Run Collingwood participants. It’s Nick Brindisi your race director here! 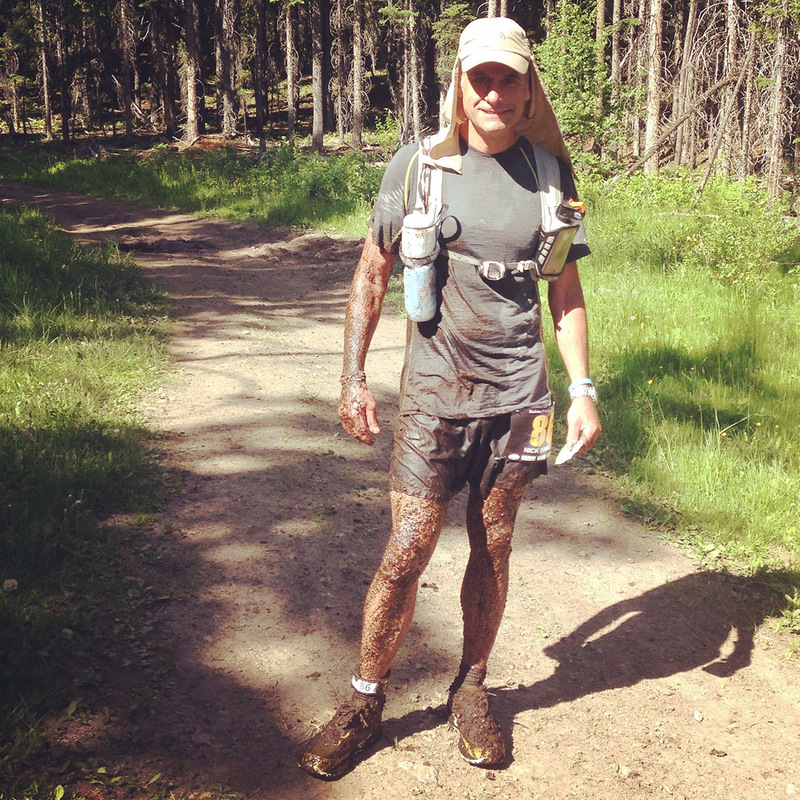 I have been busy this season running ultra marathons from Mansfield, Ontario to Coleman Alberta! I figure if you are going to organize a quality event like the Collingwood Half Marathon and 10K that I have to walk the walk or in this case run the run! Actually I’ve been running 41 of my 51 years and can’t imagine life without it. I’m keen to hear from our participants about what other races you have done this season! 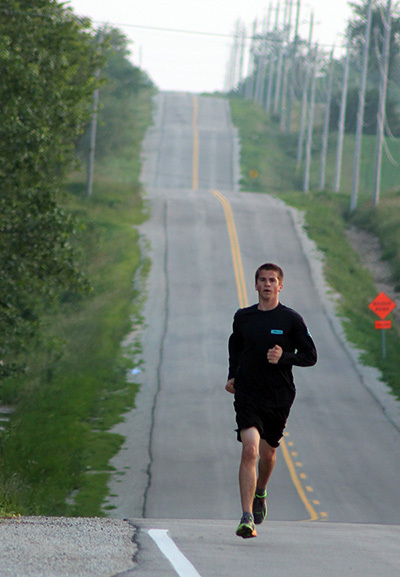 Please feel free to email me at info@myactivelifetime.com with your running story and I’ll post it here in our blog! 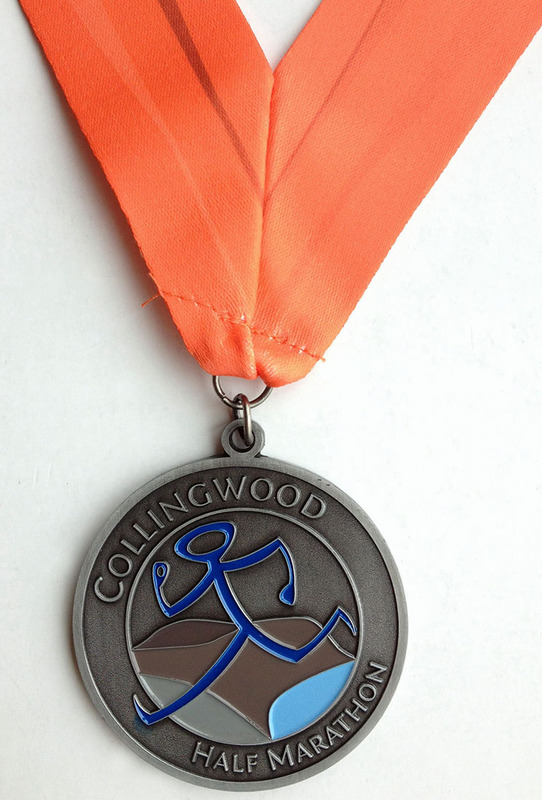 Tell us about your Run Collingwood event from last year or any other race you ran. It doesn’t even have to be a story about a race. It might be a particularly amazing run you had in a really cool location. I might ask to publish your run story on www.myactivelifetime.com, a website dedicated to healthy mind, body & spirit that includes an entire section on running. 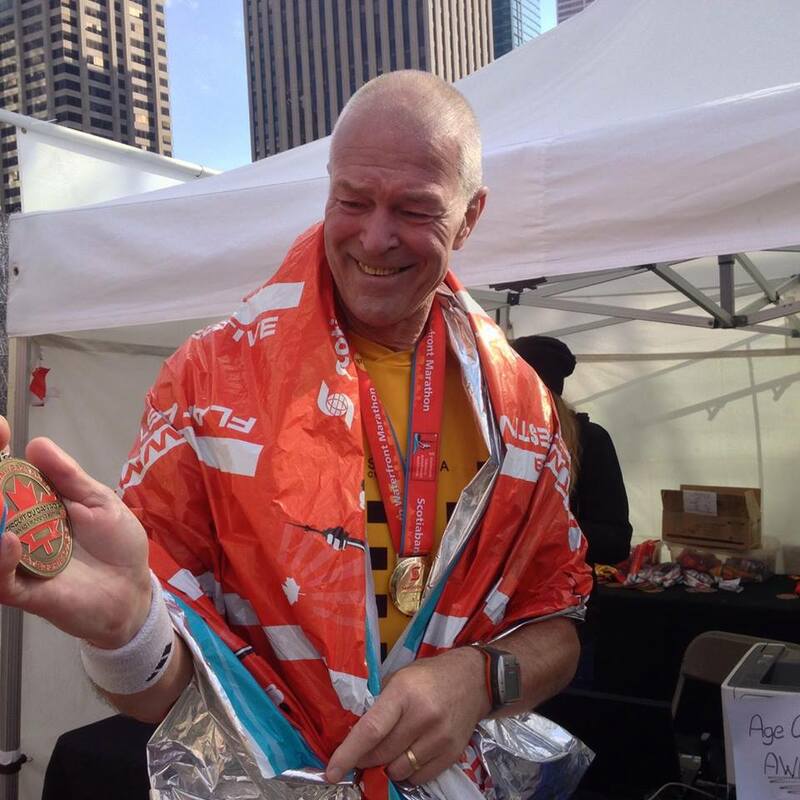 To get the ball rolling I’ll review my 2014 running season so far. Training ramped up after the Toronto Marathon to a fever pitch as I went into the “hell weeks” leading up to the taper before my 100 miler in Alberta. My coach Peter Taylor put the training to me in a big way with 470 km of training on trail with big climbs in the last 30 days before my 10 day taper. My 6th ultra marathon of the season will be the Haliburton Trail race coming up in September! I plan to run the 50 miler (80km) and make a nice tent camping weekend out of it. 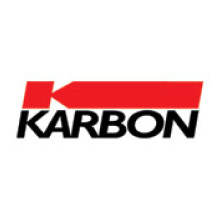 We welcome Karbon as a sponsor and also the manufacturer of our technical wicking shirts for Run Collingwood! The Run Collingwood shirt design for 2013! 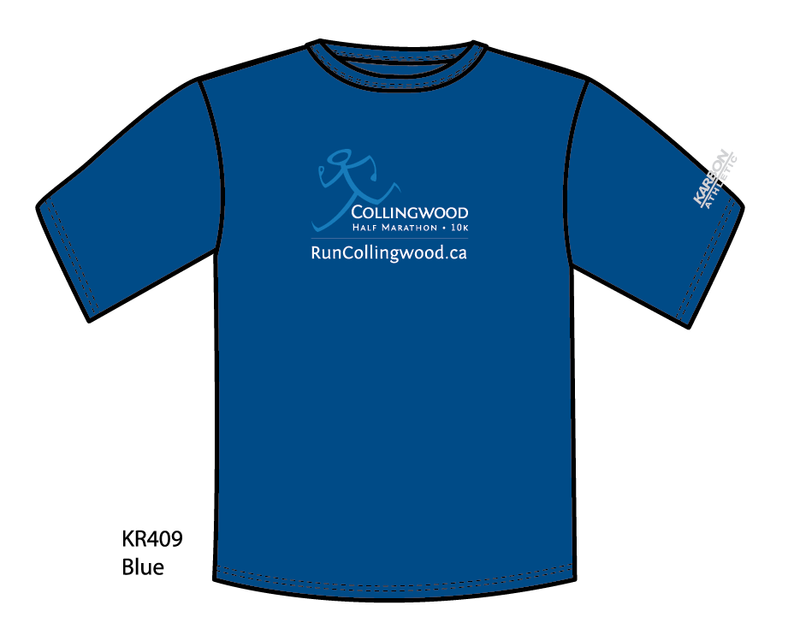 The Run Collingwood shirt design for 2013! Karbon technical wicking shirt.